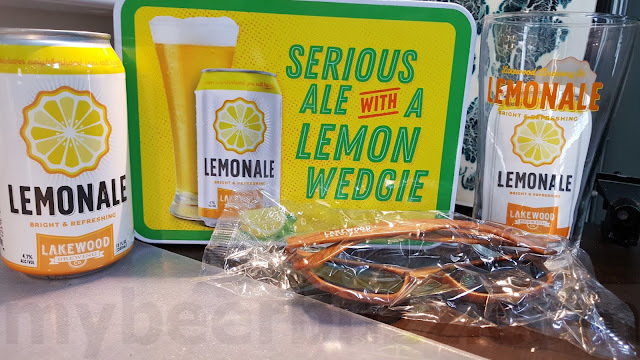 (ST. LOUIS; April 15, 2019)—Schlafly Beer, the largest locally owned craft brewery in St. Louis, announces the release of Lunar Lager, a sampler pack of four exclusive lagers, brewed to commemorate the 50th anniversary of the Apollo 11 moon landing. From the font selection to the lager styles, the collection celebrates the momentous accomplishment in American history. 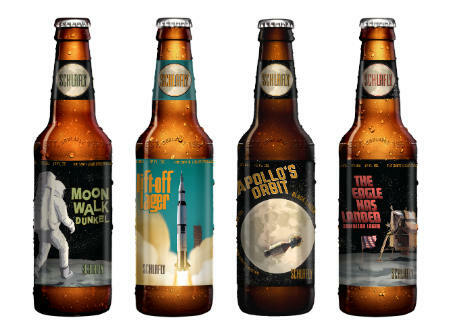 Lunar Lager will be available in 12-pack bottles, with three of each exclusive beer per pack, across Schlafly’s distribution. The bottle design and packaging thoughtfully evoke the spirit and pop culture of the 1960s. The fonts were inspired by popular records and albums from the ‘60s as well as the sans serif font, used in popular print ads and science fiction during the era. The square shape around the corners of each bottle label was inspired by the shape of a television screen, a medium through which many Americans experienced the moon landing. Additionally, the colors were inspired by the 1969 Ford and GM automotive paint chips. Lift-Off Lager (5.5%, 20 IBUs): This unfiltered German lager calls back to the moments during one of the most exciting accomplishments in America. The light golden, hazy beer is an ode to the haze that filled the air that day. Apollo’s Orbit Black Lager (5.0%, 25 IBUs): Although it’s as dark as the view outside Apollo’s window, this lager is smooth, crisp and drinkable. Moon Walk Dunkel (4.5%, 20 IBUs): This dark, malty German lager pays tribute to the two brave men who strolled across the moon 50 years ago. The dark brown lager is balanced in both malty sweetness and hops. The Eagle Has Landed American Lager (5.0%, 25 IBUs): Light, golden and refreshing, this true American lager pays homage to the famous phrase that has been cemented as one of the most memorable sayings in our history. 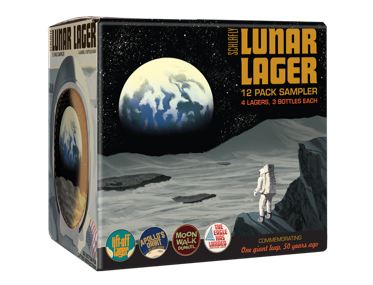 The Lunar Lager variety pack will be available for $13.99 across Schlafly’s distribution. For more on Schlafly Beer’s distribution, visit http://www.schlafly.com/beer-finder/. About Schlafly Beer: Schlafly Beer, Missouri’s largest locally owned, independent craft brewery, proudly offers over 60 unique styles of beer. Each is handmade at the Tap Room in Midtown St. Louis or Schlafly Bottleworks in Maplewood. Utilizing 102 hop varietals, 77 malts and grains, 59 different spices and fruits and 10 separate yeast strains from around the globe, Schlafly also works with local suppliers for everything from farm-fresh food to packaging and labeling. As part of its commitment to sustainability, Schlafly donates spent grain to local farmers to feed their livestock and utilizes 100% renewable energy throughout its operations. The largest Missouri-owned-and-operated beer maker offers free tours of the Tap Room (2100 Locust Street) every Sunday from 12:30 p.m. to 4:30 p.m. on the hour and Schlafly Bottleworks (7260 Southwest Avenue) from noon to 5 p.m. every half hour on Fridays, Saturdays and Sundays. The brand continues to define craft across 12 states and throughout countless fine establishments, backyards and basement bars. Join us at either of our locations and onFacebook,Instagram, andTwitter. For a full listing of seasonal and year-round beers and for information on distribution, visit Schlafly.com.